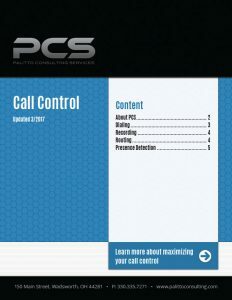 The PCS development team has developed several call control integrations in the categories of Dialing, Recording, Routing and Presence Detection. Dialing integrations include Agent Productivity Dialer, Call Blocker, Outbound IVR, Universal Dialer, Voice Blast and more! Recording integrations include call recording service, Outbound Call Recording Notification Tone, Restrictive Call Recording by Number and Call Type, and more! Routing integrations include Black List, Call Routing by Area Code and Caller ID, Custom Announcement Per DID, and more! Presence Detection integrations include Find Me Greeting, Proximity to Desk , Screen Pop for Chat Message and more!